More than 260 foreign diplomats from nearly 150 countries attended a thematic briefing on the 19th National Congress of the CPC in Beijing on Nov. 1, 2017. 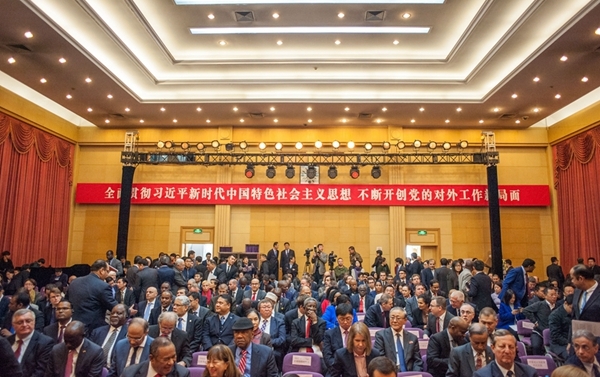 The briefing was hosted by the International Department of the Communist Party of China Central Committee (IDCPC). Guo Yezhou, vice minister of the IDCPC, briefed the diplomats about the recently concluded 19th National Congress of the CPC and explained some key words such as new thought, new era and new achievement. He said that the 19th National Congress of the CPC was a significant meeting in the time of building a moderately prosperous society and striving for the great success of socialism with Chinese characteristics for a new era. He also said that the CPC has always committed to strengthening friendship and cooperation with other countries and to forging a new form of international relations featuring mutual respect, fairness, justice, and win-win cooperation. At the briefing, Guo took questions from foreign diplomats after the introduction segment. In the report of the 19th National Congress of the CPC, China's economy is described to be transitioning from a phase of rapid growth to a stage of high-quality development. Bakhtiyor Saidov, Uzbekistan’s ambassador to China, asked whether China would change its economic plan. Guo said China would pay more attention to the quality of economic development in the period of the new normal. Mbelwa Kairuki, the Tanzanian ambassador to China, said he paid close attention to the report of the 19th National Congress of the CPC and asked whether China would change its policies concerning Africa in China’s new era. Guo responded that China will follow the principle of achieving shared growth through discussion and collaboration, and that no matter whether the countries are big or small, China will make all-round efforts in the pursuit of major country diplomacy with Chinese characteristics and build a community of shared destiny for mankind. Francesco Maringiò, a member of the Central Committee of the Italian Communist Party, said after the briefing that he took special notice on two points of the report. The first was China updating what it considered its principal social contradictions to be addressed in its development. In the new era, China faces a contradiction between unbalanced and inadequate development and the people's ever-growing needs for a better life. The second was China’s international diplomatic policies, especially the Belt and Road Initiative. He said Italy and other European countries could benefit from this initiative. Edward Boateng, the Ghanaian ambassador to China, said he thought the CPC was a strong leader for the Chinese people, and that he had learned a lot about the report of the 19th National Congress of CPC, especially the people’s development. Boateng said he will bring the report back to his country to help improve the lives of Ghanaians.